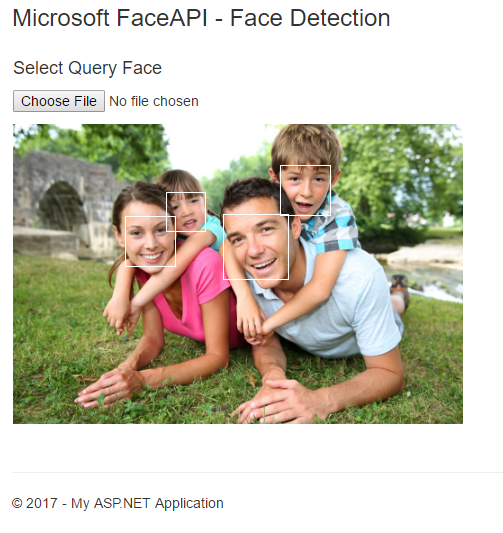 In this article, we will learn about Face API and create a simple ASP.Net MVC application to detect faces in an image by using Face API. Language Understanding Intelligent Service (LUIS): understand what users mean when they say or type something using natural, everyday language. 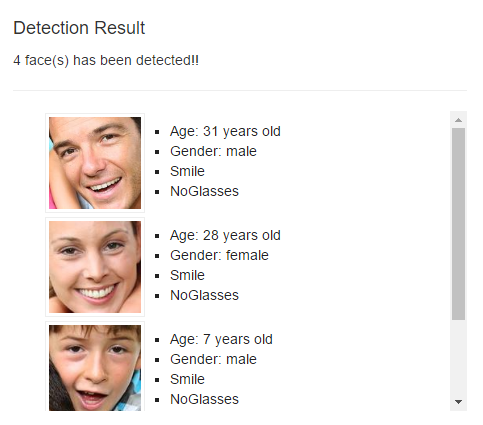 We will implement Face recognition API in our sample application. So what is Face API? Face API, is a cloud-based service that provides the most advanced face algorithms to detect and recognize human faces in images. after successfully joining it will redirect to subscriptionsmpage. Request new trials for any of the product by selecting the checkbox. Here you can see I have attached a screenshot of my subscription. In the Keys column from Key 1 click on “Show” to preview the API Key, click “Copy” to copy the key for further use. Key can be regenerate by clicking on “Regenerate”. 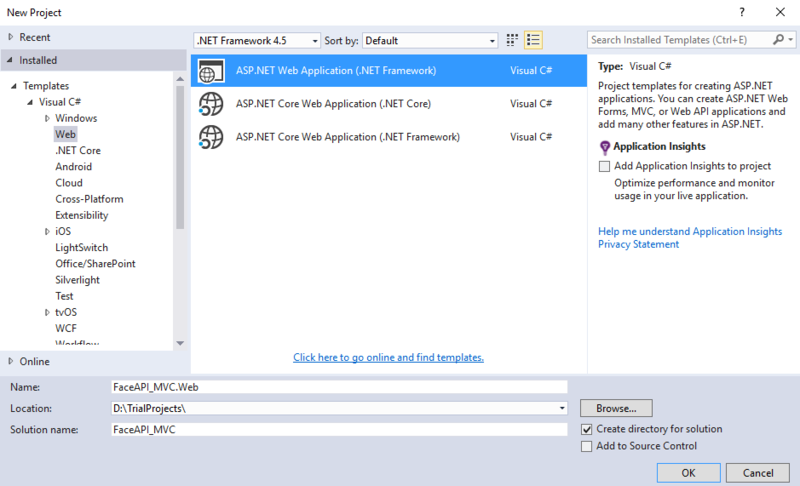 So fur we are done with the subscription process, now let’s get started with the ASP.Net MVC sample application. Before going to start the experiment let’s make sure Visual Studio 2015 is installed on development machine. let’s open Visual Studio 2015, From the File menu, click on New > Project. 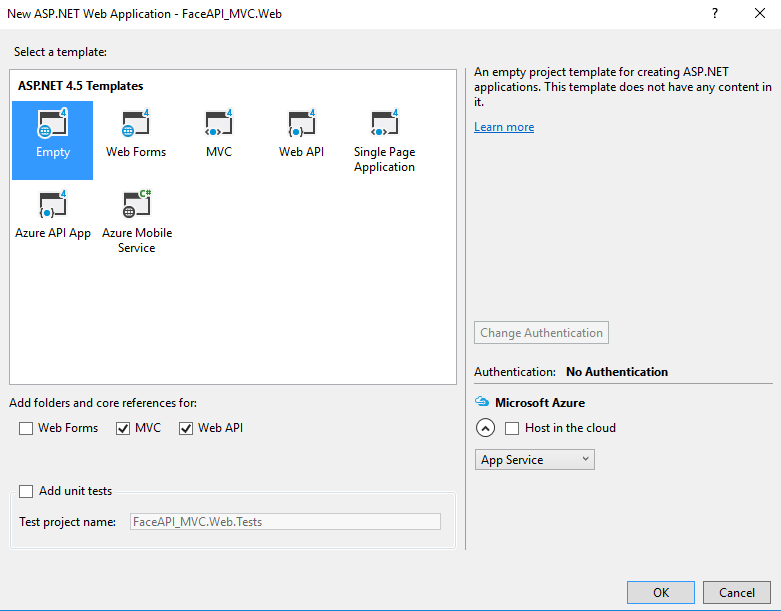 Select ASP.Net Web Application, name it as you like, I just named it “FaceAPI_MVC” click Ok button to proceed on for next step. 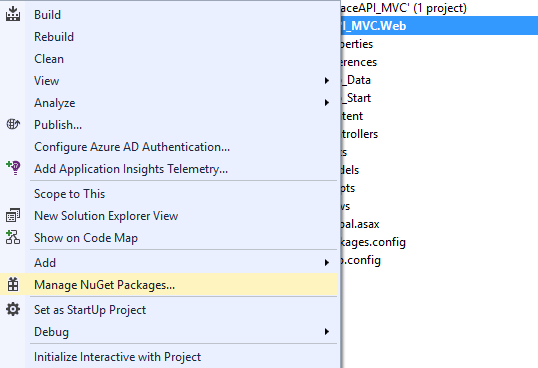 Choose empty template for the sample application, select “MVC” check box then click Ok. 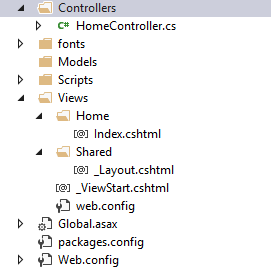 In our empty template let’s now create MVC controller and generate views by scaffolding. In Package Manager Search by typing “angularjs”, select package then click Install. After installing “angularjs” package we need to reference it in our layout page, also we need to define app root using “ng-app” directive. We need to add “Microsoft.ProjectOxford.Face” library in our sample application. Type and search like below screen then select and Install. Web.Config: In application Web.Config add a new configuration setting in appSettings section with our previously generated API Key. MVC Controller: This is where we are performing our main operation. First of all Get FaceServiceKey Value from web.config by ConfigurationManager.AppSettings. Here in MVC Controller we have two main method to performing the face detection operation. One is HttpPost method, which is using for uploading the image file to folder and the other one is HttpGet method is using to get uploaded image and detecting faces by calling API Service. Both methods are getting called from client script while uploading image to detect faces. Let’s get explained in steps. Image Upload: This method is responsible for uploading images. Image Detect: This method is responsible for detecting the faces from uploaded images. This is the code snippet where the Face API is getting called to detect the face from uploaded image. Create & Save Cropped Detected Face Images. Method that Cropping Images according to face values. Browse Image from local folder to upload and detect faces. Detected faces will mark with white rectangle. List and Separate the faces with detailed face information. You have just seen how to call Face API to detect faces in an Image. Hope this will help to make application more smart and intelligent 🙂. Working with Microsoft Technologies. Since March 2011, it was my first step to working with Microsoft Technologies, achieved bachelor’s degree on Computer Science from State University of Bangladesh(Dhaka). Have 7+ years of professional experience, currently working as Development Lead at Royal Green Ltd. 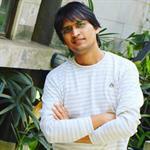 I believe in desire of learning & also love to be a part of .Net Community by sharing knowledge’s. how can i configure other url azure? Hi, i have the azure url and key for cognitive services, how can i reconfigurate the url to get data from azure? regarding the vmFace class mentioned in the Controller, do we have to create it or it is present in the Face package we added from the nuget? please do reply.... Thank you. vm for view model, n need to create it. If you use this in an app, you could get surprised when one day the service costs real money. Microsoft says "The series of services is currently available for limited free usage in beta." , so let the user beware. Thanks, of-course user need to beware of those terms(while sign-up). i have referenced the detailed link so that user can get more details.